I love brownies. If I were Will Ferrel's Elf I would have brownies as a food group like his "Candy, candy corn, candy canes, and syrup"- "Cookies, Cheesecake, Brownies, Lasagna (oh and Strawberrries of course!)" Alas, my life/diet is not made up only of brownies and cookies but you might think so from my blog! 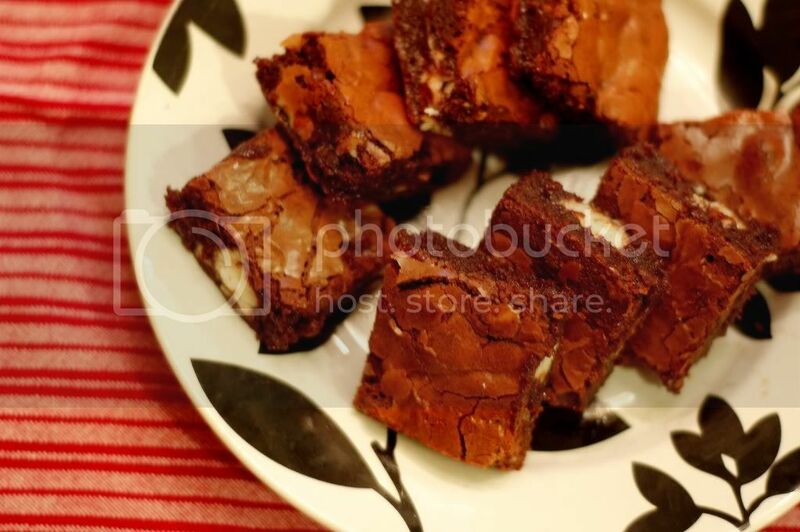 These brownies were great to add to my reportoire. Quick, delicious, almost even refreshing with the York Peppermint patties. They were also pretty flexible. I was out of baker's chocolate so I subbed in cocoa powder, a little extra milk chocolate (mixing everything up), and it all turned out. Thanks Dorie- you're brilliant. Get the recipe from Karen and make these stat. It'll ease the heat of the summer, I promise. And let me know what your favorite food groups would be. Hopefully I'm not the only one with dessert issues. PS Did you know tomorrow is French Independence Day? Come back tomorrow for our Bastille Day menu. Oh, and bring some butter. I'm making Dorie and Ina's recipes so you'll need it! One of my favorite food groups is sweet yeast rolls. Your brownies look good too. Love the big chunks of peppermint patties in your brownies. My favourite food groups: cake, more cake, custardy things, pie, maple syrup and fruit. At least one is a real food group! Oh my goodness, these look amazing. They may be going on my blog soon, too! 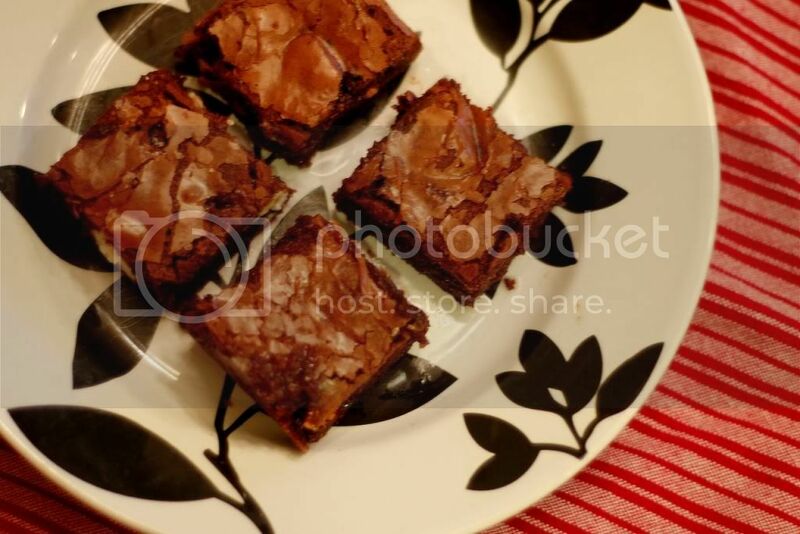 Brownies should definitely be in there own food group....your brownies look so very very good!! Mint is perfect with chocolate! There's nothing like peppermint and chocolate! Your brownies are great! And your brownies are just more proof that I did screw up. The patties just melted all over the place into a sticky mess. Funny thing is, they are still getting eaten! Yours look perfect. My favorite food group is dessert! These brownies were excellent. I love how you can see the chunks of mint in your brownies! Glad they were a hit too. I love that part of Elf when he is talking about sugar. These were good, weren't they? Yours look perfect. Hmmm, let's see, my four food groups would be brownies, choco chip cookies, hershey's chocolate and crab, LOL. I had forgotten about Elf. Thanks for the reminder! My favorite food group is salads. Love all kinds. Love your brownies. They look delicious. I swear I just quoted that line from Elf to my husband last weekend! That, and "hugs are my favorite." Your brownies look great! your brownies look delicious! So glad you enjoyed these! I found them to be refreshing as well! Oops, I quoted it wrong-- "SMILING'S my favorite!" Oh I totally believe in the brownie food group! Yours look great! I love Elf and sugar. :) Glad these turned out so well. Thanks for baking with me this week! Dairy, meat, bread and . . . brownie. What a hit - these look wonderful - so glad you enjoyed them! Mint and chocolate are definitely a great combo. Isn't chocolate a food group? Cheeese cake? Chocolate cheesecake?? Brownies look just perfect. YUMMY! I absolutely have to make these... they look so delicious! Thank you for the cookies last night! That was very sweet of you! I love your blog by the way... you have some great stuff on here!! Just wanted to let you know that I read your blog daily. Love it! Love the recipes! I tried this recipe the other day and gave over have of them to my sil (she demanded!). Thanks for sharing and thanks for doing such a great job giving out delicious recipes!